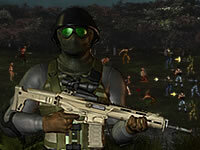 Description: An over head zombie shooter with role playing like game play. Complete tasks and survive in this post apocalyptic world. Control: Arrow keys to walk. Mouse to aim and shoot.